The comparison between electric trucks and diesel or gasoline trucks is often portrayed as a knock-down, drag-out fight with a single winner, but this one-size-fits-all mentality has no parallel in the real world of freight transport. Electric trucks are just one more alternative available to fleets, and the medium-duty market is a likely candidate for the significant, near-term adoption of battery electric technology. Significant capital and speculative investment in battery electric vehicle development is bringing a number of products out of the paper design and prototype phase and into commercial production. Evolving regional and national emissions regulations have created sufficient demand for zero- and near-zero-emission vehicles, and major original equipment manufacturers (OEMs) and start-ups are bringing viable battery electric vehicles to market. Medium-duty commercial battery electric vehicles (CBEVs) are not the solution to every market, but they are a viable alternative in daily return-to-base urban applications of fewer than 100 miles per day. Because field history is minimal, total-cost-of-ownership cost modeling for battery electric vehicles involves a number of projections, estimates, and guesses. NACFE has identified 20 generally unknown factors concerning modern fleets. The commercial space is rapidly changing, with traditional retail outlets being challenged by e-commerce companies and direct-to-consumer marketing. This shift has freight being delivered directly from warehouses to consumers, bypassing the traditional intermediate steps involved with getting the product to retail outlets. Regardless of whether the trend towards greater online purchasing continues, accelerates, or plateaus, the ability for medium-duty trucks to facilitate e-commerce growth in the next decade is promising, as is the use of battery electric vehicles. However, complex competitive, demographic, and political forces, as well as innovative technological advances make it challenging to predict the future e-commerce trajectory. While new, small companies tend to innovate quickly by taking larger risks, mature OEMs and suppliers provide experience and stability. However, they also bring with them rigidity and the need to consider new investment opportunities in terms of existing product lines and operations. Fleets identified concern over risks with start-up companies and the long-term stability needed for fleets to make investments. Several fleets indicated that to reduce risk, established OEMs need to be involved in the electric truck market. 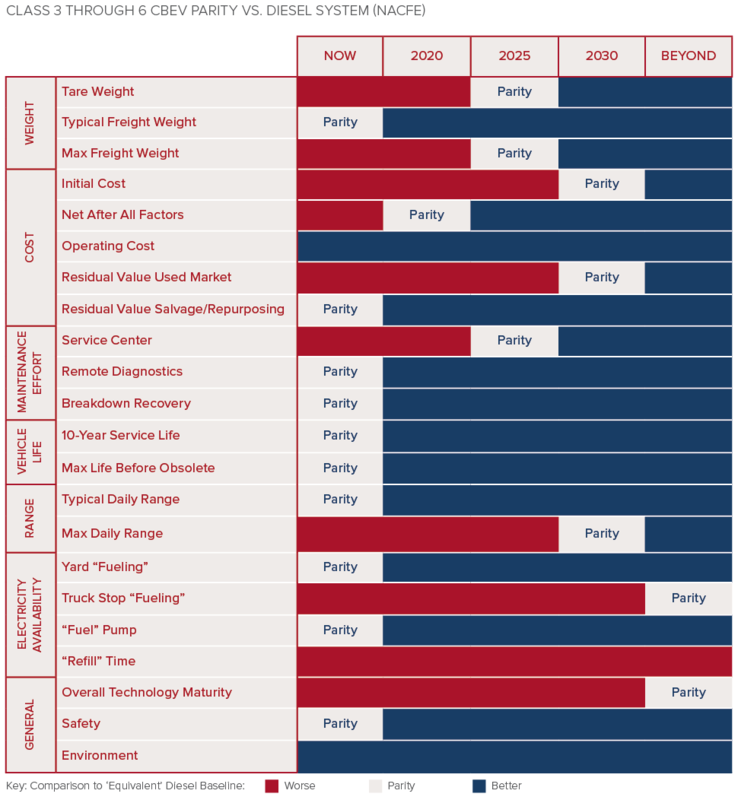 Fleets had a parallel concern with speed-to-market, where established, large companies may take longer to get innovative, new product technology on the road as compared to smaller, more nimble start-ups. Capital investment in vehicles needs to factor in a period of ownership and expected vehicle lifespan. Medium-duty vehicles tend to be long lived, but battery electric vehicles have not been on the market for very long. Significant volumes of fielded production-quality trucks are needed to establish a basis for estimating commercial lifespans in this developing marketplace. There are insufficient quantities of used CBEVs to establish trends. Until there are sufficient suppliers of used vehicles to gauge market trends, estimating the lifespan of commercial battery electric vehicles is an unknown. Estimating residual value of these long-lived diesel or gasoline trucks is largely an unknown in the face of zero-emission mandates. Historical trends will not be applicable when a diesel truck is prohibited from use in specific markets. Total cost of ownership evaluation includes estimating the residual value of a vehicle when traded. Often with medium-duty vehicles, the first owner keeps the vehicle its entire life. Thus residual value at end-of-life is based on the truck’s salvage value. Fleets operating electric vehicles found that, in some cases, parting out an electric vehicle had value as the electric motors, batteries, and parts of the control systems could be repurposed for things such as agricultural stationary uses like water pumping. Oil and refined diesel and gasoline fuel prices have seen significant volatility since 2007. Long-term predictions may not have any credibility. Maintenance cost reduction is a goal for fleets investing in CBEV trucks. An electric chassis, even one with a small ICE range extender-generator, in comparison has fewer moving parts, less caustic and hazardous fluids, and minimal high-temperature exhaust or emission systems. Battery electric vehicles are expected to extend preventive maintenance (PM) schedules for items like brakes and tires. 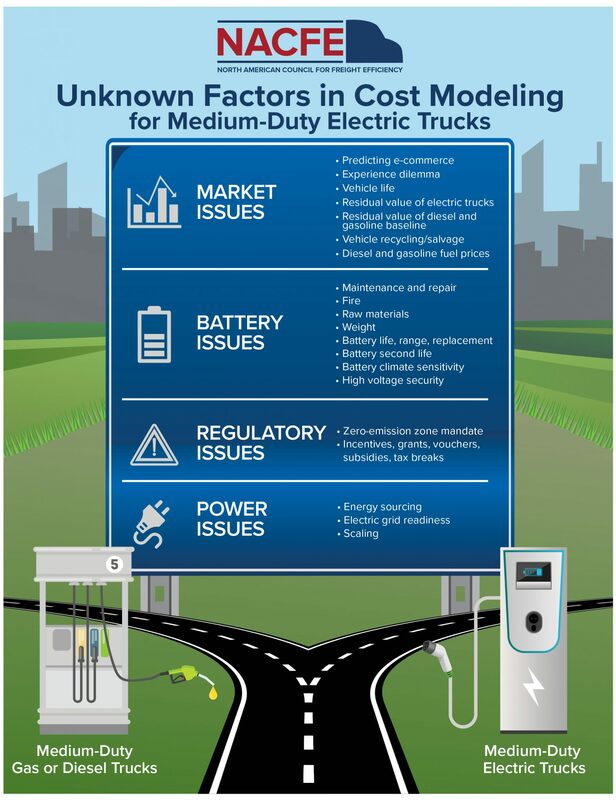 The potential exists for significant maintenance cost reductions with battery electric vehicles, but NACFE concluded that maintenance reduction is not a near-term savings for medium-duty trucks. Early generation vehicles may be equal to, or worse than, competing diesel or gasoline ones. Catastrophic events occur with all vehicle types. A common argument made by detractors of battery electric vehicles is that they catch fire, and then in showing a vehicle burning, infer the frequency is somehow alarming. However, there is no hard data to suggest this. Simply put, there is an insufficient volume of vehicles and history to accurately assess the issue. Because OEM vehicle pricing is subject to flux from commodity volatility, the raw materials required to sustain production of battery electric vehicles represent concern to capital investment by fleets. Three example materials discussed frequently in conjunction with battery electric vehicles are cobalt, rare earth metals, and lithium. Major segments of medium-duty delivery vehicles tend to cube out and are not sensitive to vehicle freight weight overloading. Vehicle weight for Class 3–6 medium-duty electric vehicle applications is not a significant risk for fleet operators as either they currently have sufficient weight margin with their freight loads or have alternate choices in GVW ratings and vehicle designs. Battery life is dependent on a number of operational factors. Vehicles require battery management systems to actively monitor the batteries, charging, discharging, and thermal profiles. With effective battery management and battery thermal-management systems, batteries can likely meet design life targets. Medium-duty vehicles tend to have long lives. If OEM battery design life is five, seven, or 10 years, then the total cost of ownership over a 10- to 30-year lifespan will require inclusion of battery replacements. Recycling and repurposing medium-duty electric truck components will be a developing factor in the total cost of ownership estimation. At present, there is insufficient experience with second market aspects of these vehicles to place firm numbers on the value of used batteries, motors, controllers, etc. Regional environmental factors can contribute to battery discharge and charge rates. The concern for fleets investing in CBEVs is that deployment to harsher climate regions may necessitate more margin in battery sizing, or acceptance of shorter ranges than might be obtained in more moderate climates. Fleets have concerns with driver and technician safety around high-voltage battery electric vehicles. The level of service-technician risk from battery electric vehicles is comparable to, or less than, that seen with diesel vehicles. Both fleets that are already operating electric vehicles and OEMs producing vehicles report that proper training is the key to ensuring a safe work environment. Regulatory mandates to adopt zero-emission vehicles in specific regions force manufacturers to produce viable alternative technology platforms. Currently, ten states have adopted the California-based Zero-Emission Vehicle Program. Zero-emission mandates may apply to specific municipalities, regions, or entire states. The primary purpose of incentives, grants, vouchers, subsidies, rebates, and/or tax breaks is to encourage the behavior of buying and using zero- and low-emission vehicles and, conversely, discourage the behavior of buying and using diesel and gasoline vehicles. Justification for subsidizing an industry rests on the belief that a new technology cannot compete on price because it does not yet have the benefit of economies of scale. Companies making capital investments in electric vehicle technology may wonder if subsidies could disappear before they have built out their fleet. The pervasiveness of subsidies combined with the slow adoption rate of commercial electric vehicles, suggests that subsidies may be a factor for the foreseeable future. There is a key difference between diesel-based and battery electric vehicles; diesel is a fuel and electricity is more like an energy carrier—and the energy can be produced by a wide variety of methods. This inherent flexibility means that vehicles are not tied to the economics of one energy source. Electrical charging can be tied to any and all electricity sources. Because capital investment requires downstream cash flows to provide returns, grid capacity tends to lag demand. Instantly building out the national grid to support proposed millions of future electric vehicles would mean a great deal of excess capacity waiting for OEMs to ramp up production. The electrical grid will respond to the increased electric vehicle volumes by making investments where demand is exceeding supply. Lead times for installation of vehicle charging systems can be six months to more than a year. The greatest concern to scaling the number of CBEVs at a site is the lead times for the charging infrastructure. Where the number of CBEV chargers at a site requires significant infrastructure changes to get power to a site, fleets will need to work with utilities and municipalities to coordinate the work. Daily return-to-base urban delivery cycles fewer than 100 miles are well suited for battery electric vehicles. The primary justification for CBEVs is to achieve zero-emissions objectives. Because there is little long-term operational data, CBEVs have many unknowns. E-commerce is increasing the need for medium-duty last mile deliveries. Recommendations CBEVs are no longer speculation. They are clearly entering the North American marketplace with every major existing OEM, and a number of new OEMs, introducing products. Electric trucks will succeed or fail under the intense spotlight of the marketplace. Fleets choosing electric trucks today will get on the learning curve ahead of those that wait. Early adopters will expose flaws and omissions that OEMs will correct. They will validate or dismiss CBEV claims. They will also learn how to optimize their operations to make the most of electric vehicles for improving their company’s bottom line financials. As CBEVs improve, these early adopters will be better positioned to rapidly take advantage of the improvements. NACFE designed a total cost of ownership (TCO) calculator to allow fleets to compare investment in one or several diesel or gasoline powered baseline trucks against an equivalent battery electric alternative. The calculator includes factors NACFE found relevant to this comparison.